First you need to know what a Mexican Sugar Skull is. Basically, during Dia De Los Muertos (Day of the Dead), people offer up these sugar skulls at the alter in remembrance. It’s sacred and spooky and sweet, just like Mexico. Naturally, Snorg Tees took this tradition and combined it with Star Wars and came up with the Sugar Skull Storm Trooper T Shirt. I actually think they captured more of an Indian color palette, like we were looking at a picture of Krishna and Ganesha, rather than a bright, vibrant Mexican sugar skull colors, but it really works. It looks quite beautiful, but you never forget that’s a Storm Trooper. And, I guess that brings to mind that Storm Troopers do have a skeleton look about them. Am I right? 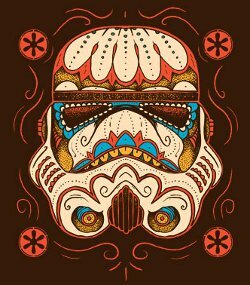 This shirt combines 3 things: Storm Troopers, Skulls and Sugar. What a great combination! So what do sugar and skulls have to do with the expendable soldiers from the evil empire in the Star Wars saga? I don’t know but I would wear this shirt just to make people wonder. I love shirts that don’t really mean anything but could make people think way too hard. I mean, it just has a cool design. Everyone recognizes the Storm Trooper and having the skull and the flowery design in there is an ironic contrast. This design is sold on hoodies as well. Sugar Skull Trooper t-shirt from Snorg Tees. This shirt doesn’t really mean anything but could make people think way too hard. Next post: Always Be Yourself Unless You can Be Batman – On sale this week, $14.95!